Vera&John Casino was established in 2011 by experienced people that know the value of listening to customer’s feedback. Although Vera&John think their casino is the best thing that happened since sliced bread. They still value your opinion and actively pushes players to get in touch with them. All and all, Vera& ohn Casino aims to create the best online gaming experience. What’s more is that the operator loves to innovate and deliver user-friendly journey. General Concept: Every day is a party. Game providers: Ainsworth, Amaya, Bet Digital, Big Time Gaming, Blueprint, Cadillac Jack, Core Gaming, ELK, Evolution Gaming, Gamevy, IGT, iSoftBet, Leander Games, Lightning Box, Microgaming, NetEnt, NextGen, Play’ n GO, Pragmatic Play, Push Gaming, QuickSpin, Realistic Games, Red Tiger, Scientific Games, Side City Studios, Thunderkick, and Yggdrasil Gaming. Special features: Tournaments, Guaranteed Winnings, Avatars, Badges, level up. Customer care availability: Open daily between 8:00 – 23:00 (GMT) on chat, phone and emails. Payment methods accepted: Mastercard, Visa, Maestro, Skrill, Neteller, Ecopayz, Paysafecard, Paypal, and Bank transfer. 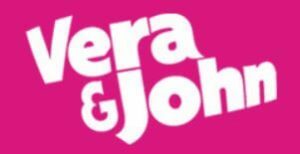 When creating an account on Vera&John you’ll get 20 Free Spins on Starburst as a thank you for trusting the brand! What’s more is that if you decide to maximise the UK exclusive bonus, you could play with as much as £150 with a deposit of £50. As always both offers are subject to wagering requirements. So, it’s worth keeping in mind that you’ll need to wager the bonus 40x after claiming it. And you’ll also need to wager your winnings from the Free Spins 40x before requesting a withdrawal. Also, know that while you’re wagering your bonuses, the max bet allowed is £6.25 on slots and £25 on table games. To claim the offer, it’s simple too since you won’t need to enter any bonus code. Indeed, a minimum deposit of £10 will activate it. But certain payment methods are excluded from the offer. Additionally, after making your first deposit you’ll also get 100 Free Spins on a large selection of games! To play your Free Spins, you’ll need to log in to your account after 12:00 every day. And for 10 days, since the Free Spins are given in batches of 10! What’s more is that you’ll only have 24h to play them too! So, make sure to set the alarm on your mobile to not miss out on free money! As we said above this casino gives you the option to play your Free Spins on many games. In fact, after claiming them, you’ll have the chance to try Book of Dead, Joker Pro, Viking Runecraft, 7 Sins, Flame Busters, Luchadora, Wild Wild West, Frog Grog, and Aloha: Cluster Pays for free. For more information on the welcome bonus or any other casino bonuses, please contact the customer support department or read the Ts and Cs thoroughly. All in all, this Casino offers a complete package of gamification and a great reward system. Indeed, not only will you get perks for levelling up, but you’ll also get new badges and earn coins! What’s more is that this casino rewards you for pretty much every action you make whether it’s making a deposit or trying a new game. And believe us, the rewards quickly add up, soon you could exchange your coins for Super Spins in the casino shop! So if you’re looking for a UK casino that offers a lot of fun and rewards, look no further as Vera&John has you covered.